Spacious and recently remodeled guest rooms with 550 sq. ft. in size, located on the upper floors of the hotel allowing spectacular views of the marina, the mountains or the bay from its balconies. King-size bed or two double beds, equipped with satellite TV, direct dial telephone and messaging service, electronic safety deposit box, individually controlled A/C, wireless internet service (complimentary), ceiling fan, balcony with screen door, robes, iron and ironing board, coffee maker and in-room mini-bar. 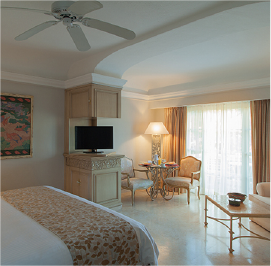 Separate shower and tub in bathrooms with marble floors, hairdryer, facial mirror and deluxe amenities. All rooms are spacious (516 sq. ft.). Cotton waffle robes are furnished for your added comfort and turn-down service is provided nightly.